Models are persons employed to pose for an artist, photographer, or sculptor. We've decide to make a top of 10 models we consider the most beautiful. Hope you enjoy! Let us know what are your favourite 10 models. Adriana Francesca Lima (born June 12, 1981) is a Brazilian model and actress who is best known as a Victoria's Secret Angel since 2000, and as a spokesmodel for Maybelline cosmetics from 2003 to 2009. Miranda May Kerr (born 20 April 1983) is an Australian model. Kerr rose to prominence in 2007 as one of the Victoria's Secret Angels. She is the first Australian to participate in the Victoria's Secret campaign and also represented Australian fashion chain David Jones. In addition, Kerr has launched her own brand of organic skincare products, Kora Organics, and released a self-help book, Treasure Yourself. Cara Jocelyn Delevingne (born 12 August 1992) is an English fashion model and actress. Erin Heatherton (born Erin Heather Bubley; March 4, 1989) is an American fashion model and actress. She is best known for her work for lingerie retailer Victoria's Secret. Candice Swanepoel (born 20 October 1988) is a South African model best known for her work with Victoria's Secret. Barbara Palvin (born 8 October 1993) is a Hungarian fashion model and actress. 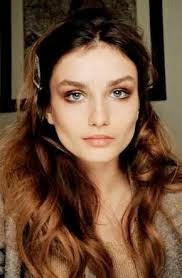 Andreea Diaconu is a Romanian model born in Bucharest in 1991. She started modeling part time at the young age of 13, with a first job for Calvin Klein in New York, while with Next Models Management. Jessiann Gravel is a Canadian model born in Quebec in 1988. Jourdan Dunn (born 3 August 1990) is a British fashion model. She was discovered in Hammersmith Primark in 2006 and signed to Storm Model Management in London shortly thereafter. In 2008, she was the first black model to walk a Prada runway in over a decade.She has attracted attention because of the paucity of black models in the fashion modelling industry. Doutzen Kroes ( born 23 January 1985) is a Dutch model and actress, who is a Victoria's Secret Angel. She started working for the brand in 2004 and became an Angel in 2008. She is on contract with L'Oréal. In 2012 she came in fifth on the Forbes top-earning models list, estimated to have earned $6.9 million in one year.